Set against the beautiful backdrop of the Cotswold Hills, Sudeley Castle is steeped in history. With royal connections spanning a thousand years, it has played an important role in the turbulent and changing times of England's past. The castle was once home to Queen Katherine Parr (1512-48) following her marriage to Sir Thomas Seymour, and has also housed Lady Jane Grey. Henry VIII, Anne Boleyn and Queen Elizabeth I all visited Sudeley Castle in its heyday. King Charles I stayed here, and his nephew Prince Rupert established his headquarters at the castle during the civil war. 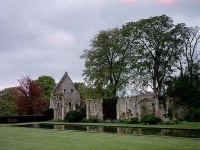 Following its destruction by Cromwell's troops, Sudeley lay neglected and derelict for 200 years; however, its romantic situation and ruins attracted many visitors, including King George III. In 1837 Sudeley was bought by John and William Dent, successful businessmen from Worcestershire, who began an ambitious restoration programme. Within the castle's apartments are a range of historic possessions dating from the civil war and an important art collection, including paintings by Van Dyck, Rubens, Turner, Reynolds, Claude and Jan Steen. The romantic 14-acre grounds are worth a visit from March to September, and are the setting for outdoor Shakespeare performances, concerts, and other events in summer.